Captured this shot at an aquarium near my place. I agree with mb that the sharpness and details are outstanding while the focus is spot on,well captured with beauitful colors and tight framing. Amazing sharpness for a 1/20 shutter. Nice colors and the black background works well. Hard to believe that as such a shutter speed, you've managed to freeze this images, without any blurr, was the fish dead, or pin to a board...)) Well executed...a small white reflector on the top would have open a little more detail on his back, an given extra contours, which are sharper on the lower part of the image. Hello,outstanding quality in this shot.That fish must have been stationary to come out this sharp at 1/20.Fantastic colors.Best regards Otto. Very nice presentation really you captured very well. The shade on Fish is really amazing different colors. Perfect sharpness here and splendid colors! Quite a natural shot, taking in consideration, the glass of the aquarium. Great details in the head of this fish, the scales are beautifully shown with the great use of available lighting. Incredible macro shot! Sharpness and details are superb and the light too. Marvellous golden/silver colours and great contrast against the black BG. Amazing golden / yellow colours with a touch of reds and blue / green.Nice close up with good exposure and razor sharp.Strong contrast against the black BG emphasising the subject, well done. Wonderful fis. 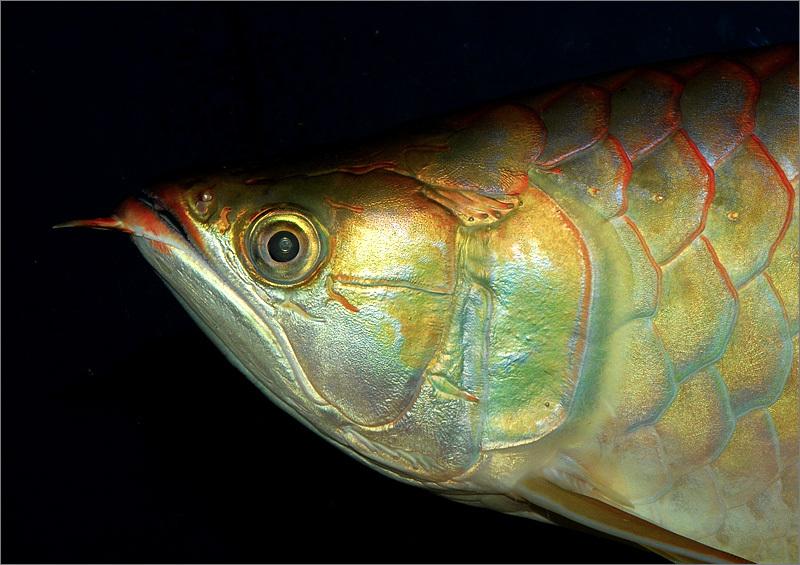 Amazing Golden Arowana. Ideal background, black background. Superb contrast and sharpness. Fine point of view, perfect cut. Superb lightness and colours.